Here's an article I wrote for the November 22, 2014 issue of The Sounds, a local Chicago newspaper. In my last article, I mentioned several different aspects of fitness. While they are all important, some are more essential than others these days. As a doctor, the most common fitness deficiency I have observed is inadequate and/or unbalanced strength. I see this across the board in people of all ages. Younger people commonly develop chronic back and joint pain from poor posture or injuries. Many older people live a lower quality of life due to their inability to move around safely and independently. Unfortunately, many end up in the hospital after falling and sustaining life-threatening injuries. Why is strength so important? Strength is the foundation of all movement, and movement is essential to health. The less strength you have, the harder it is to move around, which makes you less inclined to be active. As a result, your muscles become even weaker. This vicious cycle continues and before you know it, you are out-of-shape and suffering from various pains and health conditions. Being strong isn’t about being bigger, looking ripped, or being able to lift heavy weights. It’s about making activities easier for yourself so that you don’t strain your body as much. This includes your heart and muscles as well as joints, ligaments and tendons. Strong, balanced muscles can help improve body posture, decrease the risk of injury, and reduce or even eliminate certain kinds of back and joint pain. Fortunately, strength can be the easiest and least time-consuming aspect of fitness to build. Contrary to common belief, building strength doesn’t require going to the gym and lifting weights for hours. When your muscles are exposed to loads greater than they are accustomed to, even for short periods of time, they respond by growing stronger. This response occurs whether the load is from gym weights, heavy bags of groceries, or just your own body weight. In fact, you can build significant strength by training appropriately in as little as one minute a day, without any special equipment. Try the following exercise from my One Minute Workout. 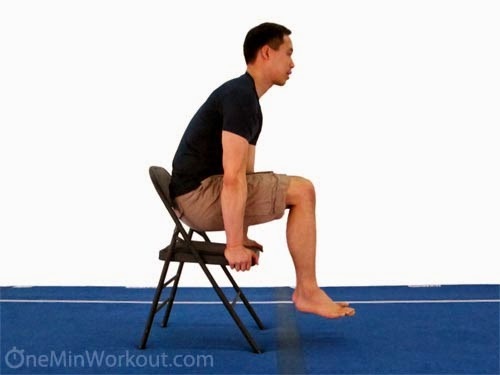 Using a stable chair, hold the “Tuck Sit Press” position shown below for as long as you can. Do your best to lift your feet off the ground. If you can’t, then let your feet touch the ground lightly but minimize the amount of weight placed on them. This is called a “Rising Chair Press”. Count or use a clock to time yourself. Stop when you get tired or when 60 seconds is up, whichever comes first. You should feel the muscles in your arms, chest, upper back, abs, and hip flexors strongly engaged during this exercise. Tip: If you have a chair with solid armrests, it may be easier to use those as supports. You can also use two chairs placed shoulder-width apart, putting one hand on each chair seat. Whether you finished a whole minute or not, chances are your abs started burning or your arms started shaking while doing the above exercise. That’s proof that your muscles were getting an intense workout. In just those few seconds, you blasted your chest, shoulders, arms, back, abs and hip flexors simultaneously. That’s almost your whole body! This is an example of how you can build significant strength without spending much time. To maximize results, finish your One Minute Workout for the day by repeating this exercise throughout the day until you accumulate a total of 60 seconds. Do this exercise daily, push yourself a little longer each time, and you’ll grow stronger and feel better. Before I go into the specific topics about health, nutrition, and exercise, I would like to share one of my philosophies with you. If you keep this in mind, you’ll always be able to figure out whether what you are doing (or not doing!) is right for you. Exercise so that you are enabled to do the things you need and want to do in life. This basic reason is essential to our survival as living beings. If we aren’t able to perform when we need to, we’ll wither or die. It’s that simple. So, whatever your other reasons are for working out, if what you are or aren’t doing is threatening your well-being in the short- and long-terms, then you should reconsider your exercise regimen. If you are the active type, consider whether you are over-exercising, especially if you have an injury. Is that extra set of reps going to be more effective than giving your body more time to rest and recover? Is training or playing through an injury worth the risk of it evolving into a debilitating chronic injury? You don’t want to make myopic decisions which disable you from staying active and performing optimally in the long-term. Once you look at your choices from this viewpoint, it becomes a lot easier to figure out which course of action is in your best interest. As we become busier and busier, remember to take a step back periodically and review your routine through this lens. This will help you stay on course toward your goals, and most importantly, give you the best chance of staying healthy. "The One Minute Workout" Book is Officially Launched! It’s taken over 4 years of hard work but the book is finally out! You can find it at Amazon (http://amzn.to/1nfv1cg) and soon, at a bookstore near you. Thanks to everybody who helped and supported me so far with this project. I couldn’t have done it without you. You can find out more about how and why the One Minute Workout works from the main website (http://oneminworkout.com) so I won’t go over that again here. Instead, I’d like to say a few words about what I hope to accomplish with this project. As a doctor, I’ve seen many people suffer the consequences of being overweight and overly inactive. They get diabetes, high blood pressure, heart attacks, strokes, addiction to pain killer medications, you name it. The sad thing is all of those things are largely preventable. Some are even reversible! We all know exercise is the answer but for some reason, it’s so much easier said than done. Healthcare professionals try to counsel their patients about diet and exercise but the results are not very encouraging. I’ve thought about this for a long time and it wasn’t until I personally became out of shape and overweight when I realized what the problem was. Movement is essential to health and strength is the foundation of all movement. Therefore, we should be focusing first on strength! We doctors usually counsel our patients about doing “cardio” activities to improve and maintain health. Recommendations often include walking, biking, running and swimming. But when you’re out of shape, your muscles are weak so moving is really hard work! It’s no wonder people rarely stick with our exercise recommendations. Plus, these “cardio” activities takes a lot of time, which many of us don’t have to spare these days. Now, some physicians do recommend some form of strength training but just telling people to start lifting weights isn’t very effective. They need regular guidance or a plan to follow so they get the results they need. This epiphany led me to create the One Minute Workout. Sure enough, after I started using this convenient workout system and building strength, I started moving much more easily. As a result of moving better, I felt better, and I started looking better as well. With some adjustments in my eating habits to match my activity level, I lost the extra fat weight and gained significant lean muscle mass. Now I’m in the best shape of my life and am much stronger than when I used to lift weights at the gym regularly. With inactivity and obesity rates increasing worldwide, this workout system addresses a fundamental part of the puzzle that is often overlooked by healthcare providers. It has already helped many people and I’m hoping it will help even more now that it’s available in book form. We all know someone we care about who can benefit from exercise. Please share this with your friends and family - together we can beat this epidemic! 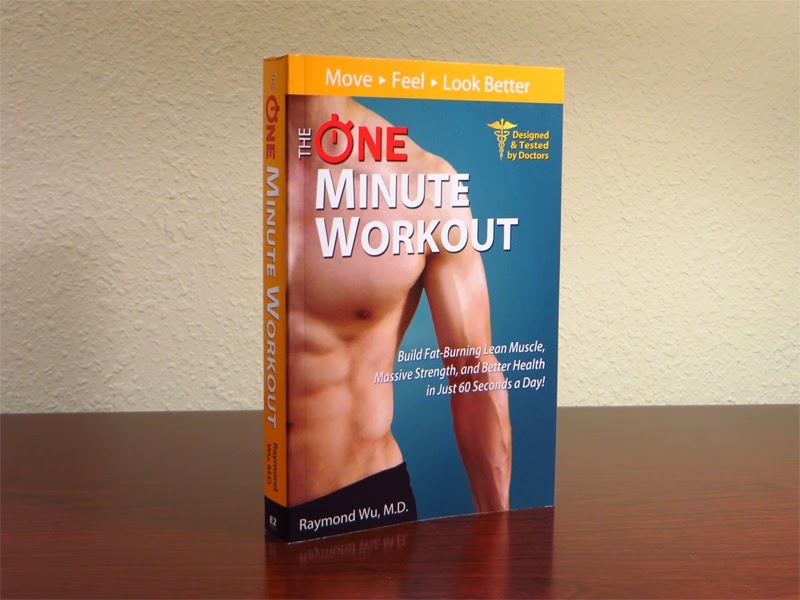 My name is Ray Wu and I'm the author of The One Minute Workout. For those of you who haven’t read the book, I created this workout as a way to get myself back into shape after years of neglect. The goal of this workout system isn’t to turn you into a fitness model or a bodybuilder, but to give you a no-nonsense way to improve your health by helping you move and feel better. It just so happens that this system can also help you build significant lean muscle and tremendous functional strength. Here’s how it came to be. To make a long story short, I used to be quite active playing many sports and studying martial arts. Then I started working long hours during my medical residency, which left me with little time to exercise like I used to. Before I knew it, I was overweight, out-of-shape, and in pain from sitting so many hours each day. After many failed attempts to get back in shape, I finally created a workout system that worked with my busy schedule and my lack of access to exercise equipment. Most importantly, it helped me get out of the chair regularly and eliminated my pain from prolonged sitting. Now, I feel great and am in the best shape of my life. After seeing how well it worked for me, I started sharing it with others, many who have reported great results as well. This book and website were created to help even more people reap the same benefits we have enjoyed from this highly effective system. As a medical doctor trained in internal medicine, I've seen people from many walks of life. Almost universally, people want to stay healthy but many don't know how or where to start. Sometimes, it’s due to a lack of knowledge or a lack of motivation. Other times, it’s due to confusion from all of the conflicting news stories and studies coming out. As a result, many people develop bodily pains and health conditions that limit what they can do and how much they can get out of life. Unfortunately, many doctors are time-strapped and ill-equipped to help their patients beyond giving generic advice like “eat better and exercise more”. The One Minute Workout is designed to be a tool for clinicians and patients alike to combat obesity epidemic that is underway around the world. My goal here is to help you become healthier so you can get the most out of your life. Through this blog, I plan to explore some of my insights on the topics of fitness, nutrition, and health, especially those that didn’t make it into the book. I hope you find it useful, a source of inspiration, and a trigger to take action. To your health and happy reading!